I don’t listen to much rock or alternative music, what I listen to is mostly rap music. So when I got the assignment that I would be shadowing the group Imagine Dragons I had no clue who they were or what they were about. My editor Jay Cridlin filled me in and told me that this is a great up and coming band and would be playing a local radio station festival in December. To preview the show we decided it would be interesting to take a behind the scenes look at how this up and coming band promotes themselves and interacts with their growing fan base. We met the band at 8:00am outside of the venue they were going to be performing later that night in Ybor City. Our day would be filled with radio station appearances, acoustic performances and a concert later that night. 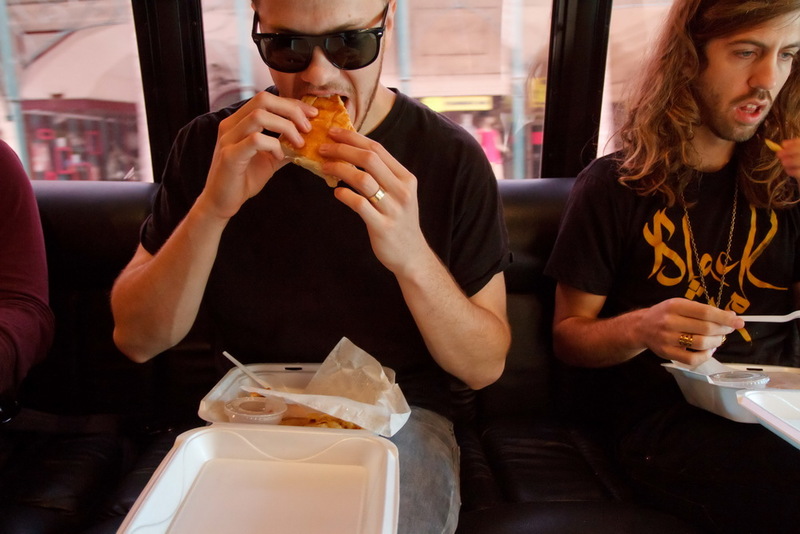 Our first stop was radio station 97X in Tampa, but first breakfast. During our ride to the radio station we got to know the band a bit more, one thing we found out early on was how hard working these guys really are. They load, unload and setup their own gear which was a surprise for a band this popular. The band does a quick stretch before grabbing their gear from the bus. Band members grab their own gear and head into the 97X Radio Station. Inside the station we were taken into a green room where the band members had a chance to meet with station big wigs and drink some tea before the start of their acoustic performance and fan meet and greet. After some down time inside the green room the band hit the stage to sing a few songs to a select group of Imagine Dragon fans. This was the first time I have ever heard a song by them and I was instantly hooked. Good music. Instant fan! After the performance the band signed items for radio station giveaways, signed autographs and took photos with fans during the meet and greet and did radio interviews. 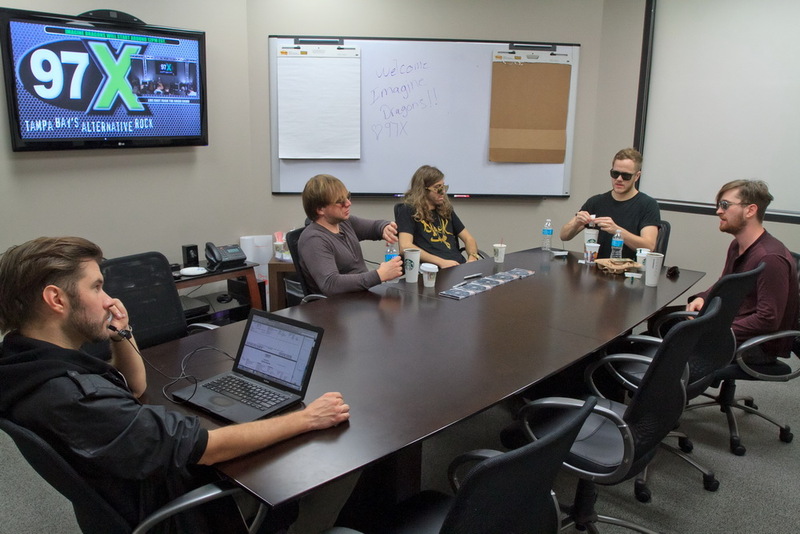 After our stop at 97X the band packed up their gear and headed to their next stop, Clear Channel Broadcasting in Tampa. 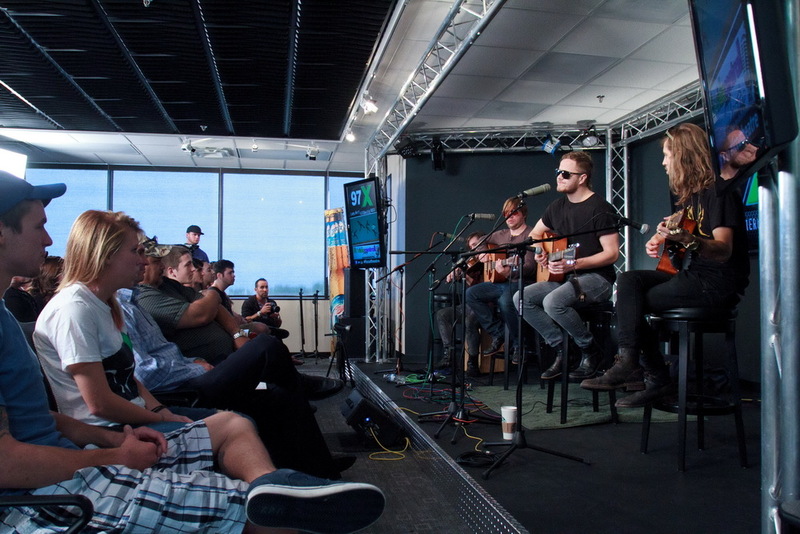 Once at Clear Channel they met with radio station 93.3 WFLZ and performed an acoustic set for a select group of fans. After leaving the station it was back to the concert venue for some down time and soundcheck. After spending all day with the band and hearing several acousitc performances I am already a fan and looking forward to seeing them rock on stage! We give the band some time to rest and check back in with them at the show. The guys really killed it on stage and I was really looking forward to seeing them perform again at the 97X Next Big Thing concert in December. Our intentions were to run this story as a cover story to preview the show. But at the last minute Imagine Dragons had to pull out of the concert to give lead singer Dan time to rest his voice. It was a bummer because we had a great package to be run in the paper but had to scrap it last minute and run another story. All in all it was great fun hanging out with these guys and I wish them the best of luck. 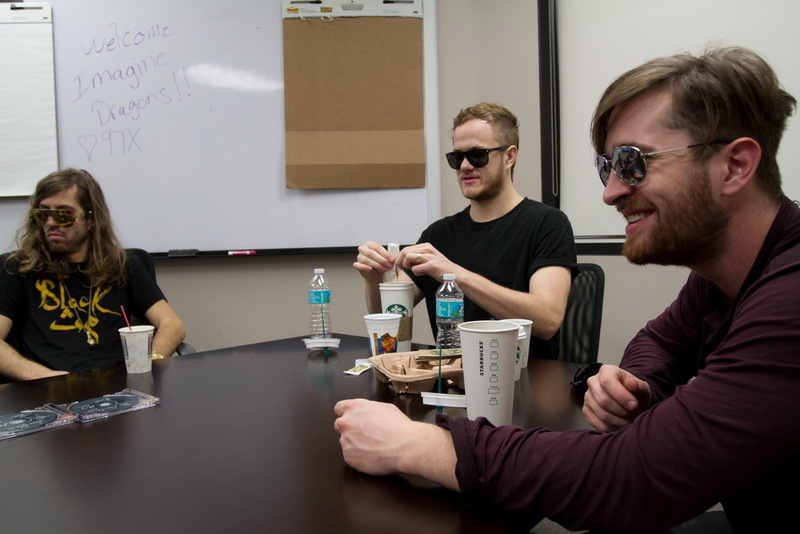 Check out their latest album Night Visions below.